Discover How To Break Free From Any Obstacle That’s Blocking You From Reaching Your Goals So You Can Experience The Success You Deserve! You’ll Be Shocked As You’ll Finally Learn How To Focus, Break Free From Information Overload, Avoid Negativity And Tackle Each & Every Project Like There’s No Tomorrow – To Help you Reach Your Goals While Earning More, Working Less And Overall Enjoy More Of Life! 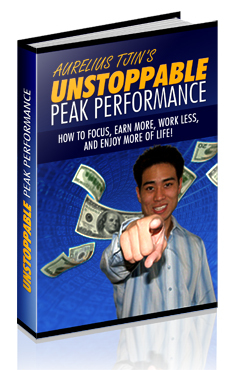 For complete details on the Unstoppable Peak Performance Guide, please click here! This entry was written by Frank Bauer and posted on May 31, 2009 at 6:23 pm and filed under Business Tutorials & Training, Products with Rights, Self Improvement Tutorials. Bookmark the permalink. Follow any comments here with the RSS feed for this post.